Minot's Ledge Light, officially Minots Ledge Light, is a lighthouse on Minots Ledge, one mile offshore of the towns of Cohasset and Scituate, Massachusetts, to the southeast of Boston Harbor. It is a part of the Town of Scituate, in Plymouth County. The current lighthouse is the second on the site, the first having been washed away in a storm after only a few months of use. In 1843, lighthouse inspector I. W. P. Lewis compiled a report on Minots Ledge, showing that over 40 vessels had been lost due to the ledge from 1832 to 1841, with serious loss of life and damage to property. The most dramatic incident was the sinking of a ship with ninety-nine Irish immigrants, who all drowned within sight of their new home land. It was initially proposed to build a lighthouse similar to John Smeaton's pioneering Eddystone Lighthouse, situated off the south-west coast of England. However Captain William H. Swift, put in charge of planning the tower, believed it impossible to build such a tower on the mostly submerged ledge. Instead he successfully argued for an iron pile light, a spidery structure drilled into the rock. The first Minots Ledge Lighthouse was built between 1847 and 1850, and was lighted for the first time on January 1, 1850. 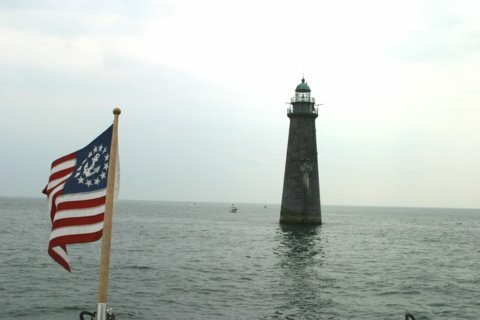 One night in April 1851, the new lighthouse was struck by a major storm which caused damage throughout the Boston area. The following day only a few bent pilings were found on the rock. The two assistant keepers who were tending the lighthouse at the time both perished. Until 1863 the design and construction of Lighthouses was the responsibility of the Corps of Topographical Engineers which resulted in a rivalry with the longer-established Army Corps of Engineers which built fortification and had responsibility, as it does today, for waterway improvements. However, the Chief Engineer of the Army Corps of Engineers was Joseph G. Totten, who personally took charge of the project to design and construct a permanent lighthouse on Minots Ledge. Totten's design was as simple as it was effective. Totten, who had extensive experience building fortifications, had a full appreciation of permanency and strength of granite constructions. He designed the lighthouse so the first 40 feet of lighthouse would be a solid granite base weighing thousands of tons. To secure the lighthouse to the ledge he had several massive iron pins emplaced so that the lighthouse would be literally pinned to the ledge by its own weight. This idea necessitated working on the ledge on the fairly few times when the sea was calm and the ledge exposed at low tide. Work started on the current lighthouse in 1855, and it was completed and first lit on November 15, 1860, with a final cost of $300,000 that made it the most expensive light house that was ever constructed in the United States. The lighthouse is built of large and heavy dovetailed granite blocks, which were cut and dressed ashore in Quincy and taken to the ledge by ship. The lighthouse was equipped with a third-order Fresnel lens. The light signal, a 1-4-3 flashing cycle adopted in 1894, is locally referred to as “I LOVE YOU” (1-4-3 being the number of letters in that phrase) and is often cited as such by romantic couples within its range. Special thanks to our neighbors and friends Bing and Carol for taking us out on their boat for a day trip that brought us nice and close to the lighthouse! Minot's Ledge is best seen by boat. There are distant views that can been seen from Cohasett and Scituate. The pictures on this page were shot from Sandy Beach in Cohasett. Take Route 3A into Cohasett. Take a left onto Route 228 then a right onto N Main St.
Stay on N. Maine St. for 2.1 miles then bear left onto Beach St.
Take Beach St. for 0.7 miles then bear left onto Atlantic Ave.
Go about 0.8 miles to the parking lot at the beach.